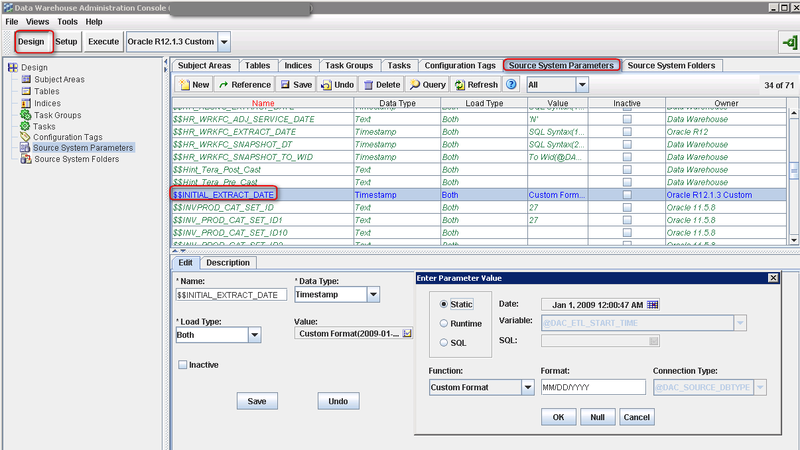 It’s possible to configure either a Full- or an Incremental Load in Oracle BIA. 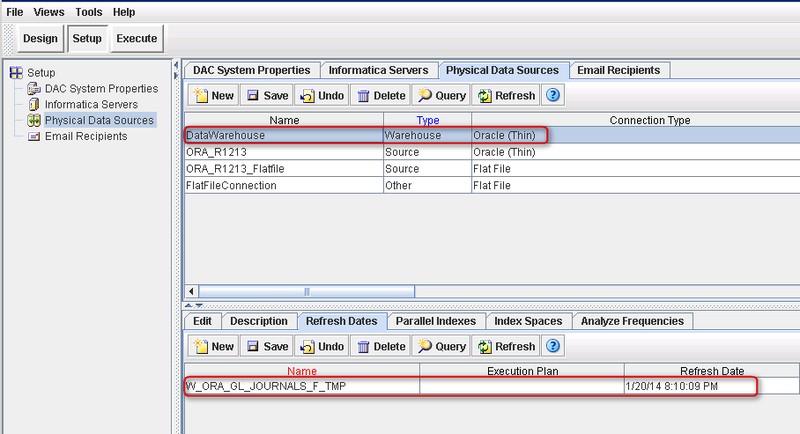 If you look at the Informatica version of Oracle BIA, there are a few areas you will have to configure. First you start with the Informatica Mapping. This will be one Mapping. It does not matter whether you run this Mapping Full or Incremental. Lets take the ‘SDE_ORA_GLJournals’-Mapping as an example. In the Source Qualifier of the Mapping (or Mapplet), you will see a reference to to the $$LAST_EXTRACT_DATE. If you would run the Mapping with these settings, you will run an Incremental Mapping. This means that you only select the data which is created / updated since the last ETL-run. 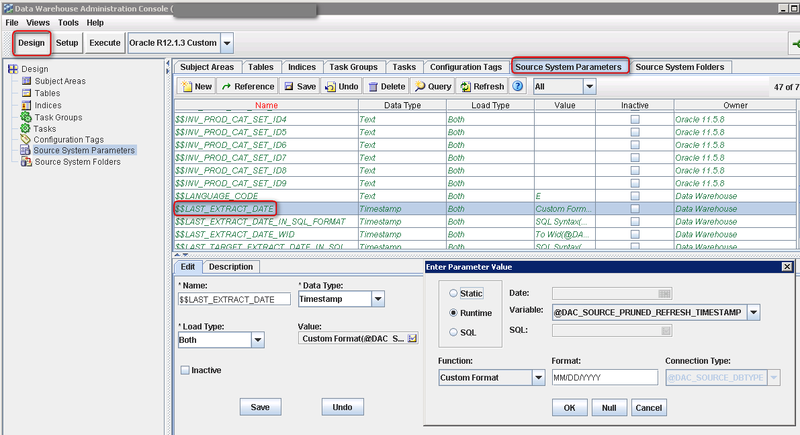 The $$LAST_EXTRACT_DATE is a Parameter which you configure in the Datawarehouse Administration Console (DAC) and reference in Informatica. 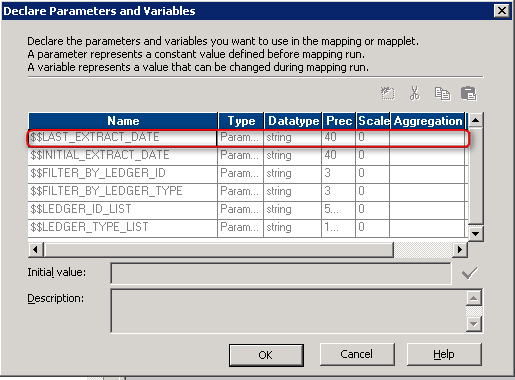 Make sure this Parameter is available in both the DAC (see above) as well as in the Mapping (or Mapplet). This way the Parameter can be used in the Extraction Mapping. If you reference a Parameter in the Extraction Mapping Query which isn’t declared, the Workflow will return an error and won’t complete. As I said before, the same Mapping is used for the the Incremental- as well as the Full-Load. If you want to run the two different loads, make sure there ar two different Workflows which run the same mapping. The difference is in the mapping of the Workflow. The Full-Workflow uses the $$INITIAL_EXTRACT_DATE whereas the Incremental-Workflow uses the $$LAST_EXTRACT_DATE. 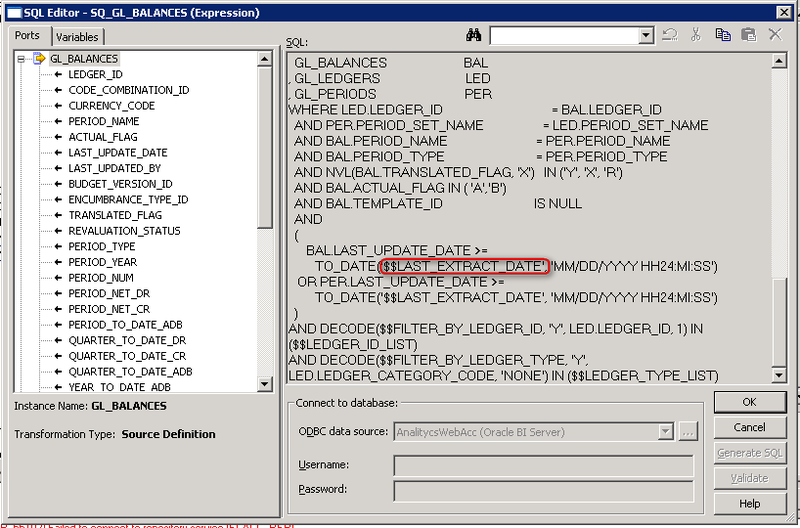 If you edit the task which belongs to the Incremental-Workflow (‘SDE_ORA_GLJournals’), you will find the Source Qualifier with the extraction query and a reference to the $$LAST_EXTRACT_DATE-Parameter. As you can see, the LAST_UPDATE_DATE is compared to the $$LAST_EXTRACT_DATE-Parameter. After each ETL-run, the LAST_EXTRACT_DATES (Refresh Date) per table are stored. You can check, update or delete these values as per requirement (see picture below). If you decide to delete the Refresh Date, a Full Load ill be performed the next time. As stated earlier, the Full-Workflow is almost identical. The only thing is that there is a reference to the $$INITIAL_EXTRACT_DATE. The $$INITIAL_EXTRACT_DATE-Parameter is defined in the DAC. You define a date in the past. Just make sure that this date captures all the data you need. How do you make sure that the $$INITIAL_EXTRACT_DATE-Parameter will be used when running a Full-Load? 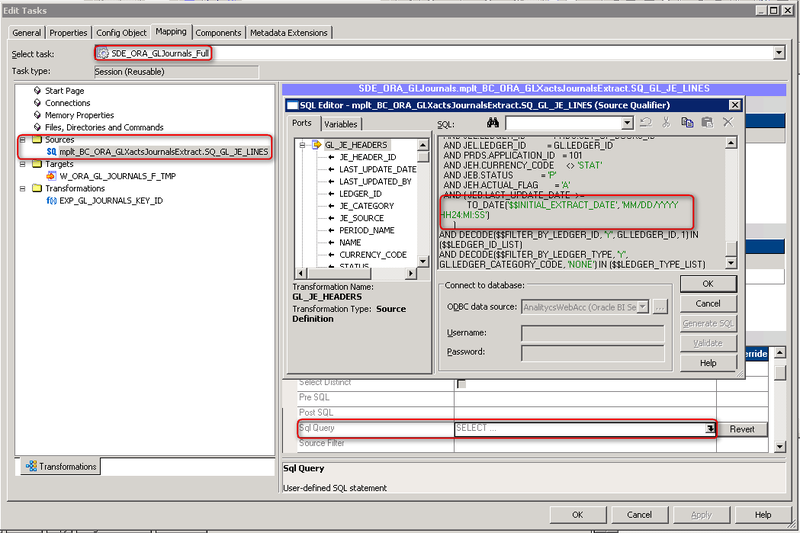 If you edit the task which belongs to the Incremental-Workflow (‘SDE_ORA_GLJournals_Full’), you will find the Source Qualifier with the extraction query and a reference to the $$INITIAL_EXTRACT_DATE-Parameter. As you can see, the LAST_UPDATE_DATE is compared to the $$INITIAL_EXTRACT_DATE-Parameter. At this point everything is in place to either run a Full-, or an Incremental Load. Check the Informatica Session Log when the ETL has a another result than expected. It could be that the Workflows are incorrectly defined. You will see in the Session Log which Parameter is used and what the value of that Parameter is. Hi Daan, thanks for this! really helpful! I am new to informatica somewhat and I am attempting to optimize the execution plans and the biggest thing I can do straight away is to create incremental loads as opposed the full runs performed every night! My question is how do deal with the loads (SILS??) from a staging table that a workflow (SDE )has populated – is this dealt with exactly the same as above? I am very confused with the way the etls were designed as they appear to designed as incrementals but are run as full. so they have last updated date parameter but there are no refresh dates defined and a checkbox to always run in full mode that is checked. Please accept my apologies if this isn’t an easy question to answer! kind of in the deep end here! Thanks for visiting and reading my blog. It has been several years since I worked with Oracle BI Applications and Informatica. As far as I can remember the ETL truncates the SDE and incrementally loads the ‘new’ data. The SIL only ‘sees’ the incremental data hence no additional requirements are necessary to specify the incremental strategy for the SIL tables. I do not have an environment to verify this, but I hope this makes sense? Reblogged this on A Little about DW..!! A Little about BI..!!. Pingback: OBIA (Oracle BIApps) – 7.9.6.4 : Full Load vs Incremental Load | A Little about DW..!! A Little about BI..! !